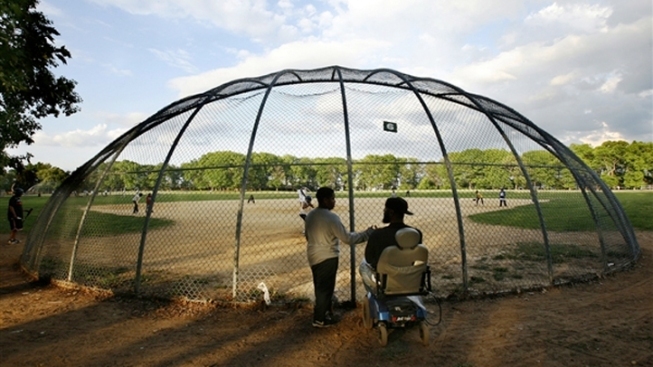 Newark Eagles Little League team player William Jones gives Coach Rodney Mason a high-five as he arrives at practice at the practice field at Weequahic Park on May 15, 2008. The statistics are sobering. Newark, N.J., has a murder rate double that of the Bronx. A third of its residents live in poverty. Only 40 percent of its students graduate from high school. Behind those numbers, though, are people trying to beat the odds. In his new book, “A Chance to Win: Boyhood, Baseball, and the Struggle for Redemption in the Inner City,” reporter Jonathan Schuppe chronicles that effort through the story of a fledgling Little League team, its improbable coach and inspiring players. At the center of the narrative is Rodney Mason, a drug-peddling ex-con left paralyzed from a drive-by shooting who decides he can make a difference by starting a baseball team in a city where America’s pastime holds little allure. For weeks, Rodney had been combing the neighborhood for recruits, but now it was late March, a couple of weeks before the start of the 2008 Little League season, and he had only a handful of completed registration forms. Baseball just didn’t seem to be on many people’s minds. Some kids had actually told Rodney that they hated baseball, recoiling as if it were some kind of social disease. He couldn’t understand it. This was the national pastime, the game everyone played when he was growing up. And today was the day. If kids didn’t show up this morning, then they never would. Rodney hoisted himself out of the tub and dried off. He slipped on a condom, fitted to a urine collection bag, and strapped the contraption to his right leg. He ironed his jeans and white T-shirt and switched to a battery-powered scooter that the family of an elderly neighbor had given him after the old man died. Then he rode a lurching elevator to the lobby and rolled out in the gray chill. The neighborhood was just starting to come alive, people stepping onto their stoops, assessing the weather, waving to neighbors, retreating inside. The field was empty. So was the parking lot. Rodney pulled up to the dugout, jammed his hands into the pockets of his Yankees windbreaker, and waited. Please god, he prayed. Help me make this happen. Sometimes, when he was not working and his children were at school, Thaiquan Scott stopped by the Jackie Robinson South Ward Little League’s old field at the St. Peter’s Recreation Center to catch a game. The diamond was lousy with lumps and the quality of play was terrible, but he occasionally noticed a gifted athlete who, if he found the right coach and stuck with it, could probably go on to play in high school or college. Thaiquan wondered why more black kids weren’t interested in baseball. Thaiquan and his family lived on the second floor of a narrow three-family house with cream-colored vinyl siding on Peshine Avenue. Their block was not what you’d call kid-friendly, though there were many children. Dope fiends and drunks puttered around in the abandoned lot across the street. Brash young drug dealers played noisy games of dice on the stoops of homes, the tenants too frightened or too complacent to complain. A few days after the Scotts moved in, a thirty-nine-year-old woman was killed in a drive-by around the corner. Thaiquan and his wife wanted to leave Peshine Avenue, but their house was one of the only places they could find that was cheap and large enough for the seven of them. So they made the best of it by keeping the kids busy and trying to expose them to the world outside the city. Thaiquan saw baseball, and sports in general, as a bulwark against the streets; the more his kids played, the less chance that something bad would ever happen to them. His father had been an amateur player – a damn good one, he’d heard, but drinking got in the way, and the old man left home without ever passing the game on to Thaiquan. Now he wanted to give his two oldest children – Nasir, his biological son, and Kaneisha, his stepdaughter – that chance he never got. He pledged that as soon as they reached playing age, he’d sign them up for Little League. In late March, Thaiquan got word that Nasir and Kaneisha had been assigned to a team. They went to meet their coach and were surprised to see that he was in a wheelchair. Thaiquan introduced himself and felt like he understood Rodney immediately. It began with a trickle: a child here, another there, and soon there was a crowd. Among the first arrivals was Derek Fykes, who arrived with his grandmother Irene. He was ten but had the face of a tired man: eyes narrowed, brow rumpled, lips slack. He had just been removed from his father’s apartment by the state child welfare agency. This wasn’t the first time he’d been abruptly pulled from one home and placed in another. Probably wouldn’t be the last, either. Irene worried about the lasting damage of an unsettled childhood. But baseball was one of the few things that helped Derek regain his footing. Derek was an anomaly in that he’d played Little League before. Just one other boy, a heavy trash-talker named William (who went by “Pooh”), had any experience. The others were young and scrawny and clueless; most didn’t have gloves, and some didn’t know if they threw right-handed or left-handed. DeWan Johnson, a magnetic 10-year-old with a gap-toothed grin and nubby dreadlocks that poked from his head like spring shoots, was one of the most promising recruits. No one had taught him how to swing a bat or throw a ball or encouraged him to play baseball at all, for that matter. What little he knew about the game came from watching kids in the park and the Yankees on TV. He had an untethered rocket of an arm and bravely planted himself in front of hard-hit grounders. Rodney assigned him to third base. The kids were arriving in packs now. A pickup game began. Rodney suddenly looked overwhelmed. A couple of fathers offered to hit grounders, keep the books, whatever they could do to assist. Another man showed up and said he, too, wanted to coach. By that afternoon, Rodney figured that he’d talked to about a hundred people. When Kelley, the league president, stopped by to see how things were going, she found dozens of kids calling themselves Eagles. They threw like shot-putters, swung bats like axes, ran shrieking through the infield with little clue what they were doing. It was hard not to chuckle, watching them swirl around Rodney as he tried to figure out what to do next. His sister Darlene showed up and was startled by the sight. Rodney didn’t care. The hardest part, in his mind, was over; he now had something to work with, something that he could shape into a team. It would not be pretty. But it would happen. Finally. He couldn’t wait to get started.